“Rappin' With The Jackson Five” Commercial 7" Single (USA) In 1970, The Jackson Five released this interview record (#3779) through their official magazine called “TCB” (Takin' Care Of Business). 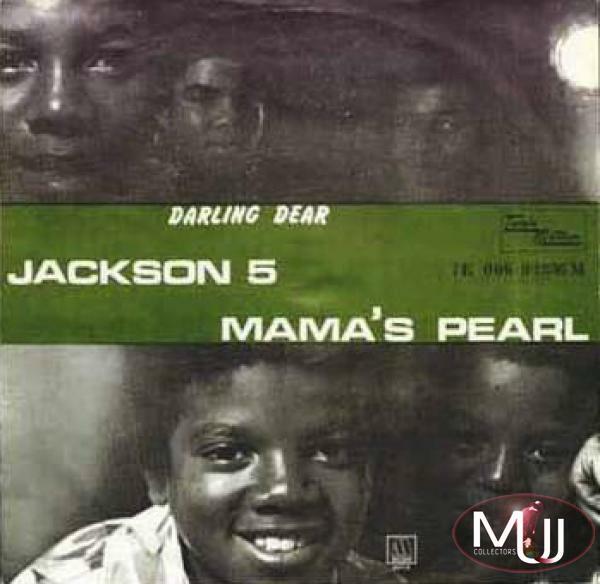 This record was exclusively available through the magazine, and was issued with a rare USA picture sleeve (the only other Jackson Five record to be commercially released with a picture sleeve in the USA was Mama’s Pearl). In excellent condition (sleeve and record) the record is worth about $900. 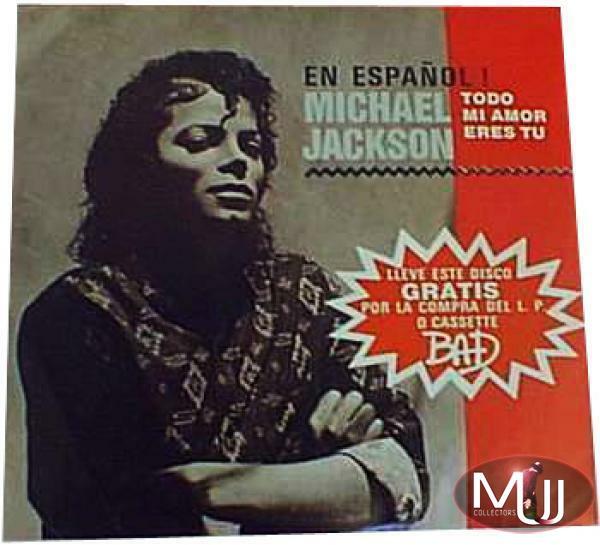 Michael Jackson “Todo Mi Amor Eres Tu” *Black Cover* Commercial 7" (Costa Rica) This extremely rare Costa Rican commercial issue (#7045456) of “Todo Mi Amor Eres Tu” comes in a unique black and white picture sleeve with an image of Michael slightly different from the other versions. In excellent condition (record and sleeve) the record is now worth at least $500. The Jackson 5 “The Love You Save” 4 Track EP 7" Single (Thailand) This rare Thai commercial four track EP (#MTR-453) includes The Love You Save, (Come Round Here) I’m The One You Need, La-La Means I Love You, and Never Had A Dream Come True with a unique “collage” picture sleeve. In excellent condition, this record is worth $300. 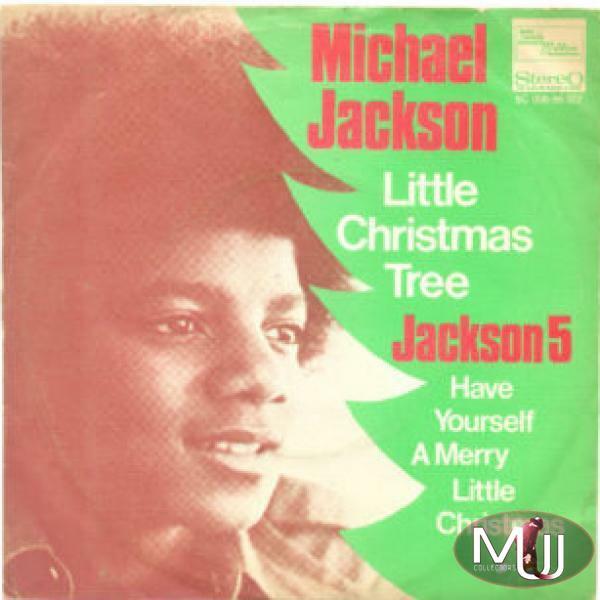 Michael Jackson/Jackson 5 “Little Christmas Tree” Commercial 7" Single (Holland) This uber-rare 1970 Dutch picture sleeve record of “Little Christmas Tree” (#5C 006-96007) was likely the only time this song was commercially released as a single, making it extremely rare (further, Christmas oriented releases always have a smaller print run and a shorter shelf life). This record is backed with “Have Yourself A Merry Little Christmas” by The Jackson 5. In excellent condition (sleeve and record) this record is worth about $250. 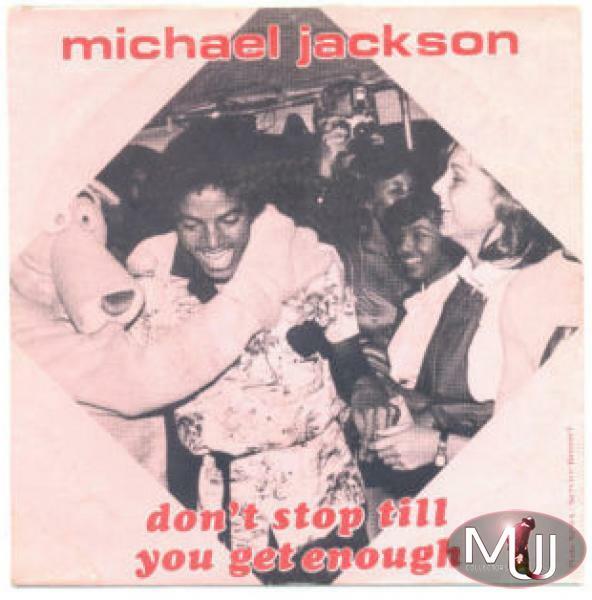 Michael Jackson “Don't Stop 'Til You Get Enough” Commercial 7" Single (Belgium) This scarce Belgian commercial release (#ZSS 9-50742) was issued in 1979 with an extended “Long Version With Rap”, and a stellar picture sleeve of Michael dancing with Tatum O' Neal. In excellent condition (sleeve and record) this record is worth about $250. 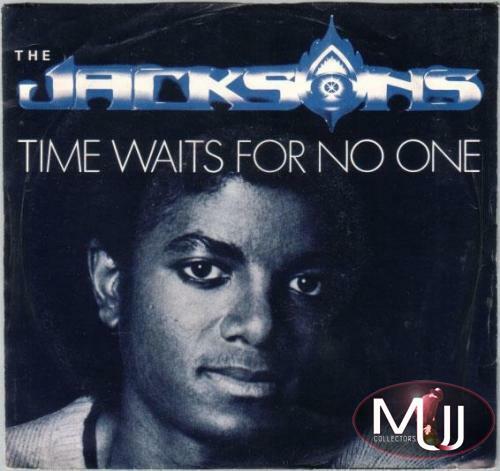 The Jacksons “Time Waits For No One” Commercial 7" Single (Australia) This rare Aussie commercial issue (#ES 555) is one of the few releases of this song (it was also released in the UK), and the only one issued with a picture sleeve. 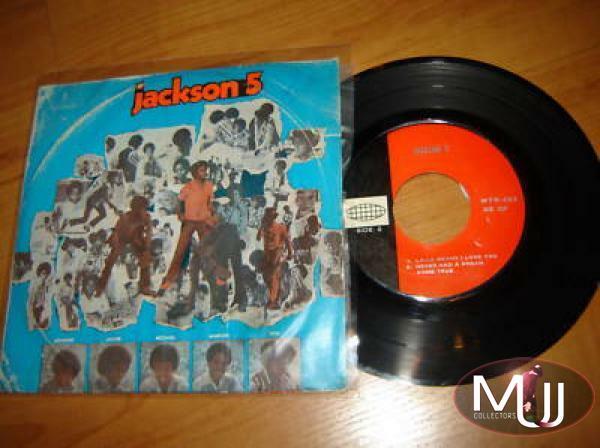 The sleeve itself is unique, since it pictures only Michael, although it is a “Jacksons” song (the full group is pictured on the back). In excellent condition, this record (with picture sleeve) is worth about $250. 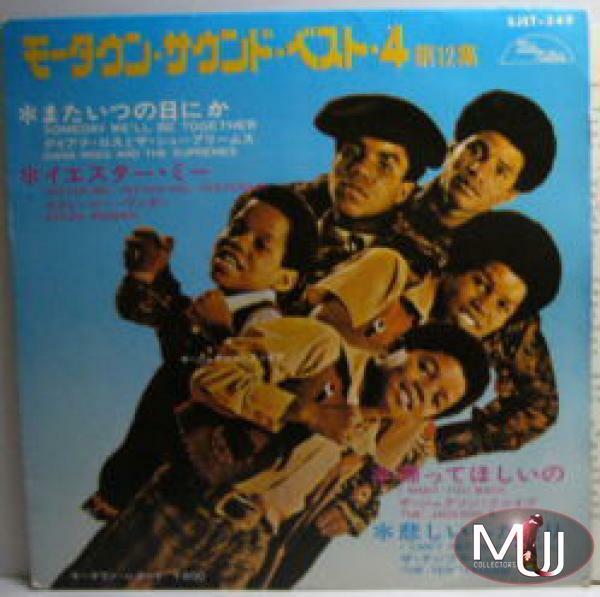 The Jackson Five: "I Want You Back" 4 Track EP 7" Single (Japan) This Japanese Tamla Motown EP (#SJET-549) features a Jackson 5 picture sleeve and their first Motown single “I Want You Back”. Also included are tracks by The Supremes, Stevie Wonder, and The Temptations. This record (with sleeve) in excellent condition is worth $180. The Jackson 5 “ABC” Commercial 7" Single (Norway) Rare Tamla Motown Norwegian release of “ABC” (#7E 006-91257M ) with picture sleeve. In excellent condition, this record is worth about $180. 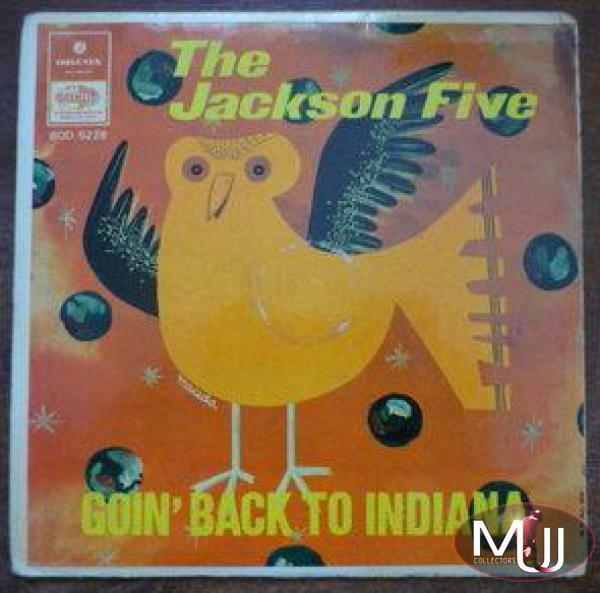 The Jackson Five “Goin’ Back To Indiana” Commercial 4 Track EP 7" Single (Bolivia) This four track EP from Bolivia features the J5 songs Goin’ Back To Indiana, Mama’s Pearl, I’ll Be There and How Funky Is Your Chicken. On the EMI - Odeon label, (#BOD5228) this record was released in 1971 with an unusual picture sleeve of a bird. In excellent condition, this record is worth about $180. 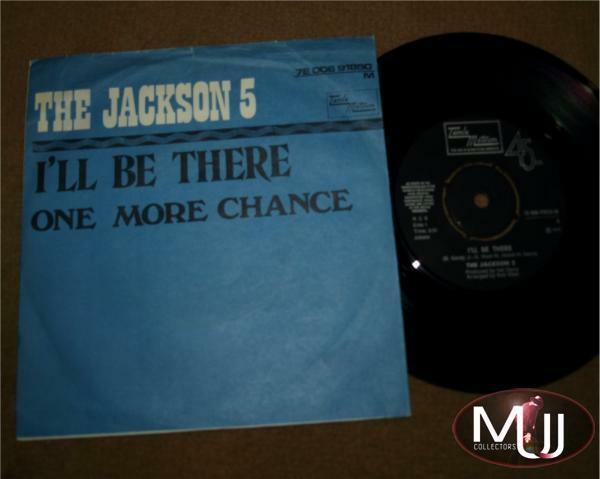 Michael Jackson “Got To Be There” Commercial EP 7" Single (Thailand) This 1971 Thai EP (#SAS-EP-246) features Michael Jackson’s first solo release “Got To Be There”, along with a picture sleeve with his face on it. In excellent condition, this record is worth up to $180. Jackson Five “I'll Be There” Commercial 7" Single (Norway) This rare Norwegian commercial issue of I’ll Be There (#7E 006-91850) is housed in a blue title sleeve. In excellent condition, this record is worth about $180. 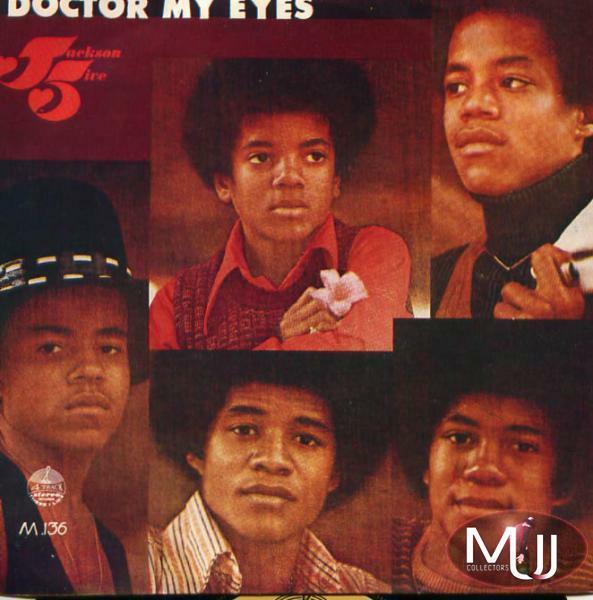 The Jackson Five “Doctor My Eyes” Commercial 4 Track EP 7" Single (Thailand) This four track Thai EP features Hallelujah Day and Doctor My Eyes by the “Jackson 5ive” on Side A, and The Cisco Kid by War and Oh La De Da by The Staple Singers on Side B. On the “Thai Records” label (#M-136) this 1973 release includes a nice Jackson Five picture sleeve, and is worth about $150 in excellent condition. 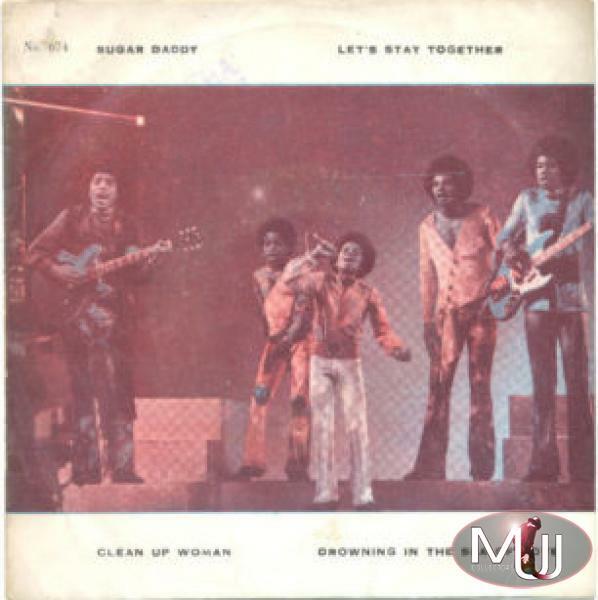 The Jackson Five “Sugar Daddy” Commercial 7" Single (Italy) This Italian commercial 7” single on the Tamla Motown - RIFI label (#TSM NP 64119) features a “blue starred” unique picture sleeve of the group. In excellent condition, this record (with sleeve) is worth about $150. 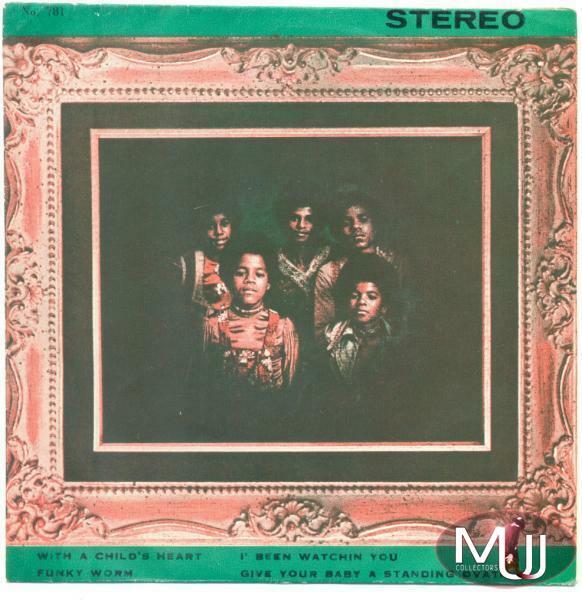 Michael Jackson “With A Child's Heart” Commercial 4 Track EP 7" Single (Thailand) This scarce 1973 Thai 4 track EP (#TK-781) features the Michael Jackson solo track “With A Child’s Heart” and three other non MJ/J5 songs. 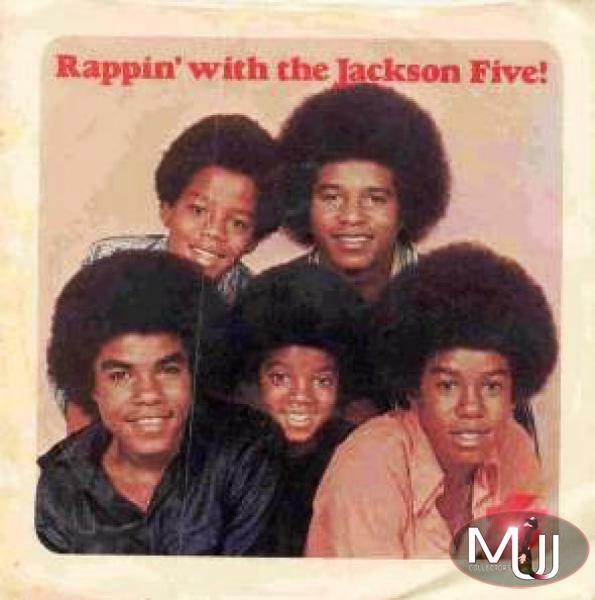 Comes in a unique picture sleeve similar to the cover of the J5’s “Greatest Hits” LP with all the brothers (even though this is a solo Michael Jackson song). In excellent condition, this record (with sleeve) is worth about $150. The Jackson 5 “Mama's Pearl” Commercial 7" Single (Norway) Tamla Motown release from Norway with catalog #7E 006 92236. This record comes in a black picture sleeve like the cover of the “Third Album”. In excellent condition, this record (with sleeve) is worth about $150. The Jackson Five: “Doctor My Eyes” Commercial 3 Track EP 7" Single (Malaysia) This Malaysian three track EP (#UR-126) was released on the Uranya Record label in 1973. It features a nice “yellow” sleeve with Michael on the cover. 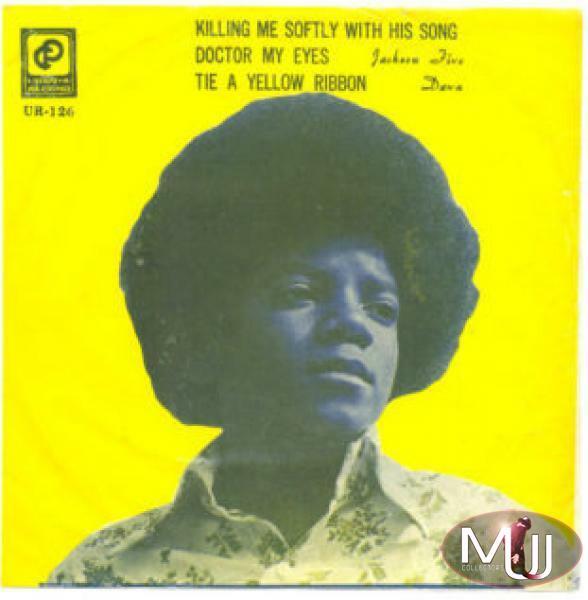 Aside from Doctor My Eyes, it also includes two non-J5 tracks: “Killing Me Softly With His Song” and “Tie A Yellow Ribbon.” In excellent condition, this record is worth about $150. 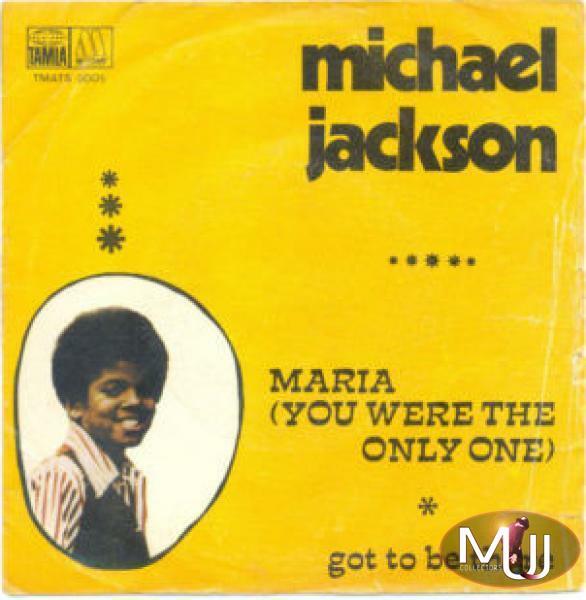 Michael Jackson “Maria” Commercial 7" Single (Portugal) This Tamla Motown Portuguese release features two solo Michael Jackson Motown tracks “Maria (You Were The Only One)” and “Got To Be There” in a unique double sided orange/yellow picture sleeve (#TMATS 5 005). In excellent condition (with sleeve), this record is worth about $150. 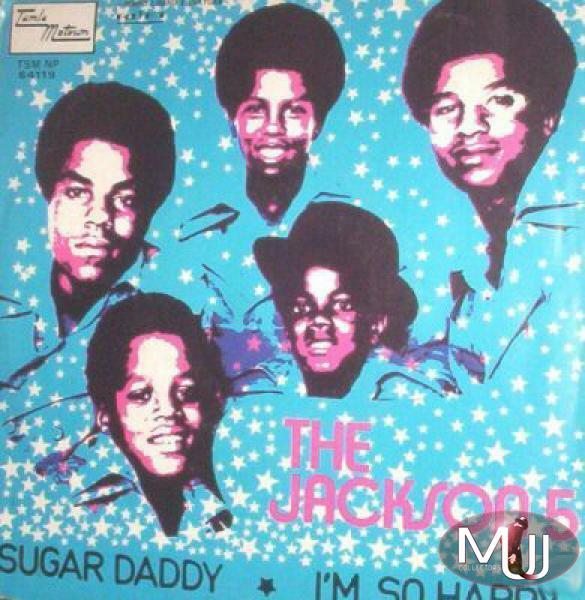 The Jackson 5 “Sugar Daddy” 4 Track EP 7" Single (Thailand) This four track 1971 Thai EP (#674) features Sugar Daddy by the Jackson Five (and three non-J5 songs) in a lovely “live performance” picture sleeve. In excellent condition, this record is worth about $150. 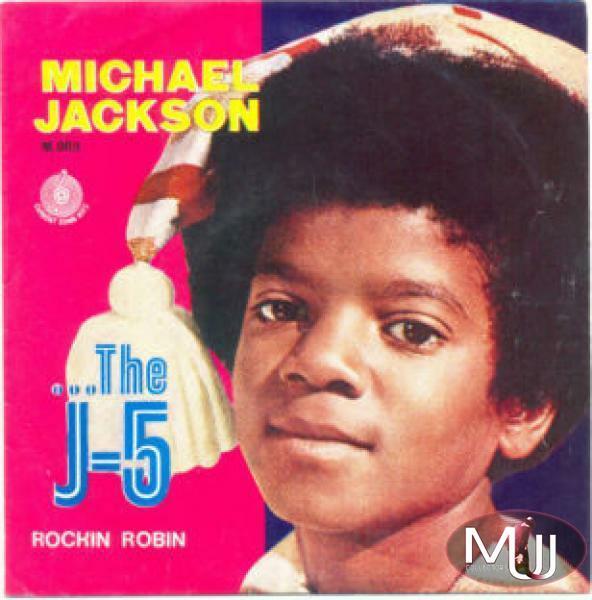 Michael Jackson “Rockin' Robin” Commercial 4 EP 7" Single (Thailand) Rare Thai 4 track EP (#TK-038) featuring “Rockin’ Robin” and three other non MJ/J5 songs. 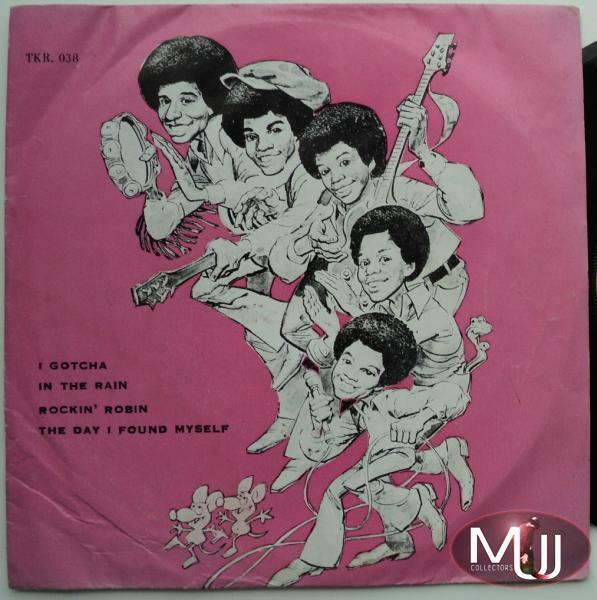 Issued in a totally unique pink picture sleeve of The Jackson Five from their cartoon show with all of the brothers (even though this is a solo Michael Jackson track). This is the first of two different EPs of “Rockin’ Robin” released in Thailand. In excellent condition, this record (with sleeve) is worth about $150. 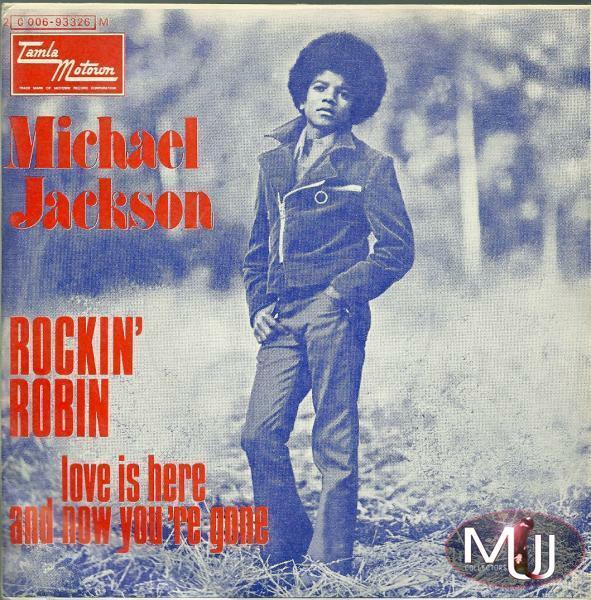 Michael Jackson “Rockin' Robin” Commercial 4 Track EP 7" Single (Thailand) This rare four track Thai release (#M-009) on the Current Song Hits label includes Rockin’ Robin and three other non-MJ/J5 tracks (including Am I Losing You by The Partridge Family). 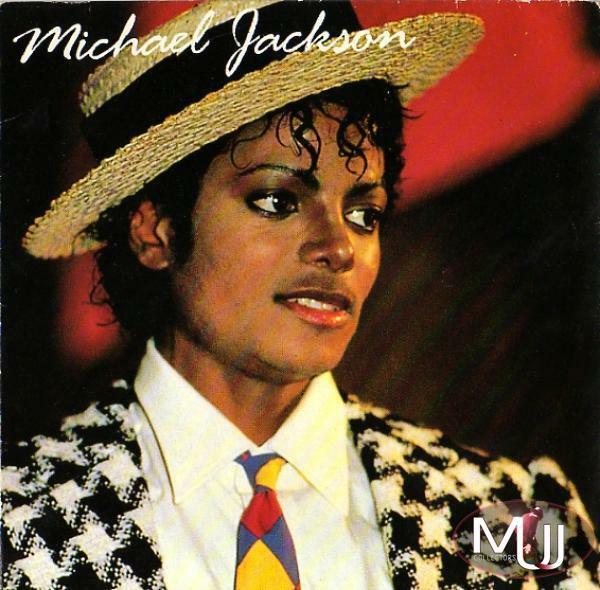 Adorable and completely unique cover sleeve with Michael wearing a “nightcap”! This is the second of two different EPs of “Rockin’ Robin” released in Thailand. In excellent condition, this record (with sleeve) is worth about $150. The Jackson 5 “Moving Violation” Commercial 7" Single (Italy) This rare Italian Tamla Motown release (#TSM NP 64232) from 1975 may be the only release of “Moving Violation” as a single. Includes a rare title picture sleeve. This record in excellent condition is worth about $150. 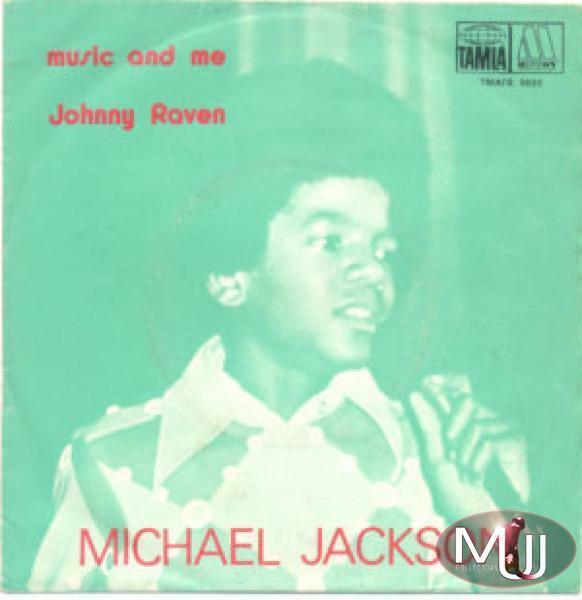 Michael Jackson “Music And Me” Commercial 7" Single (Portugal) This rare 1973 Tamla Motown release from Portugal (#TMATS 5035) comes in a unique green tinted picture sleeve of a young Michael singing. In excellent condition, this record is worth about $150. 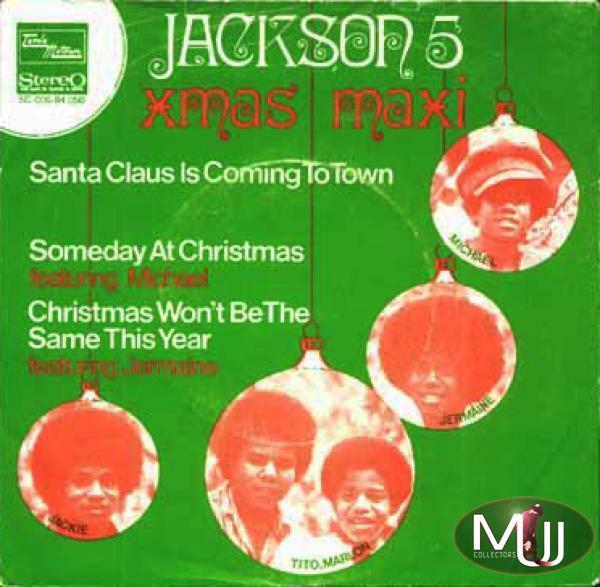 Jackson 5 “Xmas Maxi” Commercial 3 Track EP 7" Single (Holland) This rare Dutch EP issued in 1970 (#5C-00694050) has three Jackson Five tracks taken from their Christmas album: Santa Claus Is Coming To Town, Someday At Christmas, and Christmas Won't Be The Same This Year. Features a unique “Christmas ornament” picture sleeve. In excellent condition, this record is worth about $150. Michael Jackson “Rockin' Robin” Commercial 7" Single (France) This rare French commercial issue of Rockin’ Robin (#2C-006-93326) comes in a unique picture sleeve of Michael. In excellent condition, this record is worth about $150. 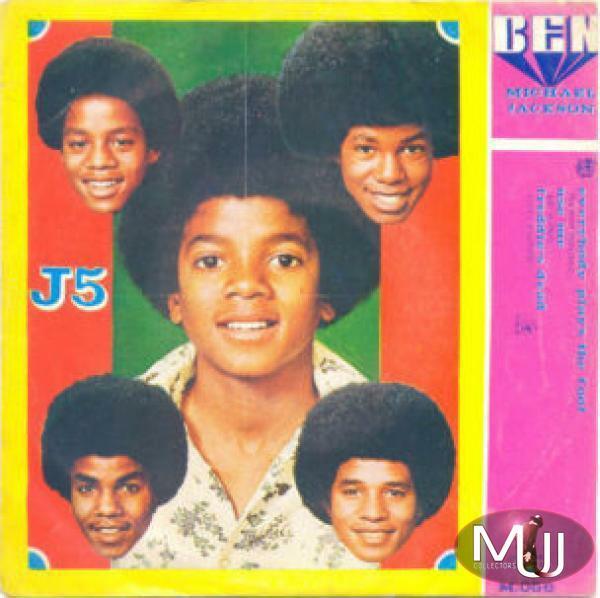 Michael Jackson “Ben” Commercial 4 Track EP 7" Single (Thailand) This Thai 4 track EP on the Current Song Hits label (#M-056) features Michael Jackson’s solo hit “Ben” and three other non MJ/J5 tracks. The stellar color picture sleeve features a large picture of Michael, along with pictures of Marlon, Jermaine, Tito, and Jackie (even though Ben was a solo track). This record in excellent condition (with sleeve) is worth about $150. 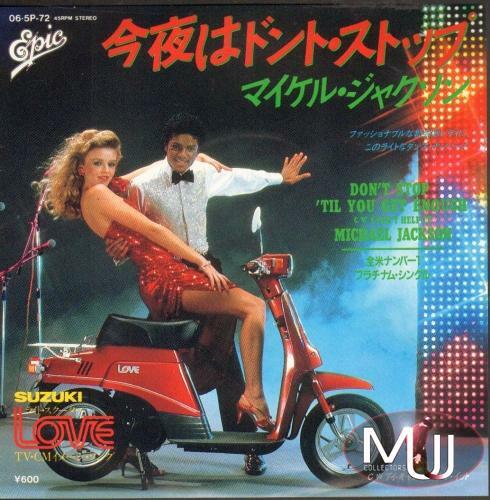 Michael Jackson “Don't Stop 'Til You Get Enough” Commercial 7" Single (Suzuki Motorbike Cover) (Japan) This rare Japanese vinyl record (#06.5P-72) of “Don’t Stop ‘Til You Get Enough” came in a special “Suzuki” sleeve as part of the Michael Jackson ad campaign for the “Suzuki Love” motorbike. This record with sleeve in excellent condition is worth about $130. There were only two records with these special sleeves, the other being this one for “Off The Wall” (#06.5P-94) which is worth about $100. 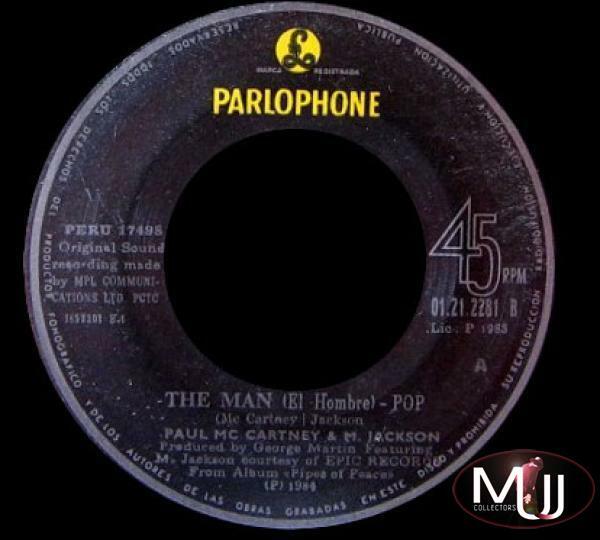 Visit the Commercial 7" Singles section of our Memorabilia Showcase for a complete list of all Michael Jackson, Jackson Five, and Jacksons commercial 7" Singles. Michael Jackson “Someone In The Dark” Promo 7" Single (USA) The rarest and most sought after Michael Jackson 7” vinyl record is the USA white label promo for “Someone In The Dark”, taken from the "E.T. Storybook" album. 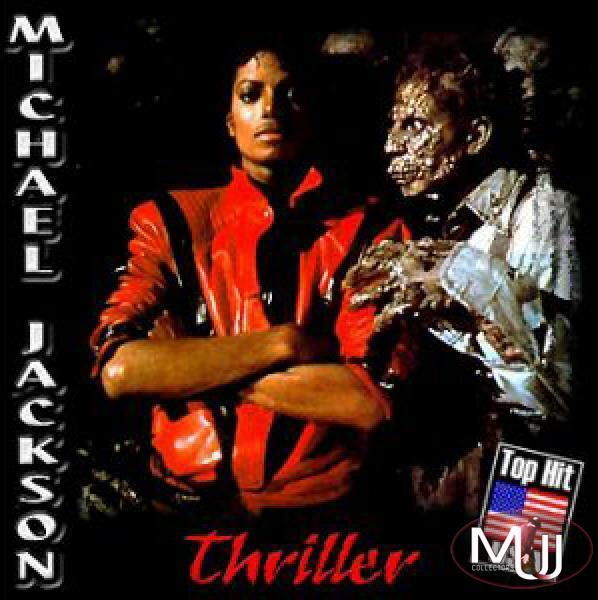 Issued by MCA Records in November, 1982, this record was cancelled and never commercially released due to a lawsuit filed by CBS, who wanted to protect the soon to be released “Thriller” album. 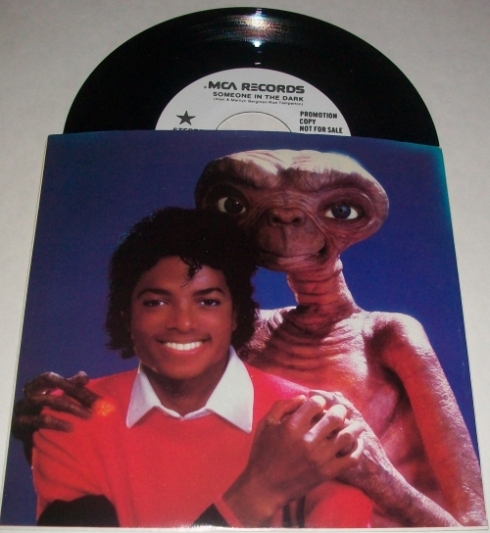 The double sided picture sleeve features a portrait of Michael with ET on the front (above) and the contents of the “ET Storybook” on the back (shown left). Catalog number is #S45-1786 with A side being the “Long Version” and B side being the “Short Version” of “Someone In The Dark”. Due to the lawsuit, the release was quickly pulled, although a few promotional copies of the record sent to select radio stations are known to exist. In excellent condition (record and sleeve) the record is now worth between $1700-1800. The Jacksons “Pepsi World: Promotional 7" Single (USA) This promotional release was included in “Pepsi World: 'The Choice Of A New Generation” industry magazine sent to select radio stations and media outlets to promote the 1984 Jacksons Tour Campaign, sponsored by Pepsi. 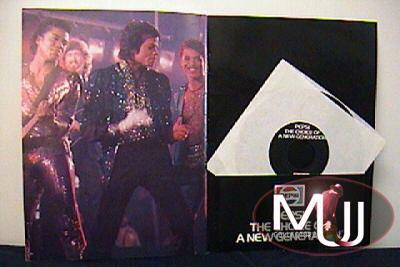 The record came inside the folder and includes the jingles Michael and The Jacksons recorded for Pepsi commercials. This package with magazine and record in excellent condition is worth about $400. 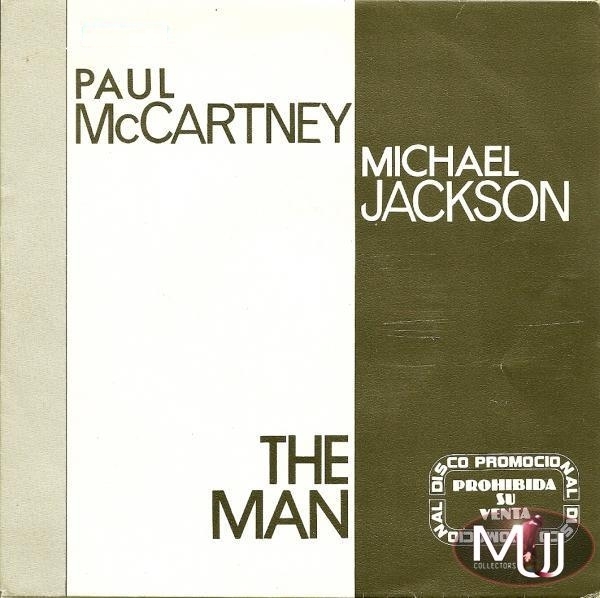 Paul McCartney With Michael Jackson “The Man” Promo 7" Single *One Sided* (Spain) This rare 1985 Spanish white label promo record is one sided and is on McCartney’s EMI/Odean label. Comes in a double sided title sleeve. Catalog number is P-042. Very few vinyl releases of “The Man” were issued, making this record in excellent condition worth about $350. 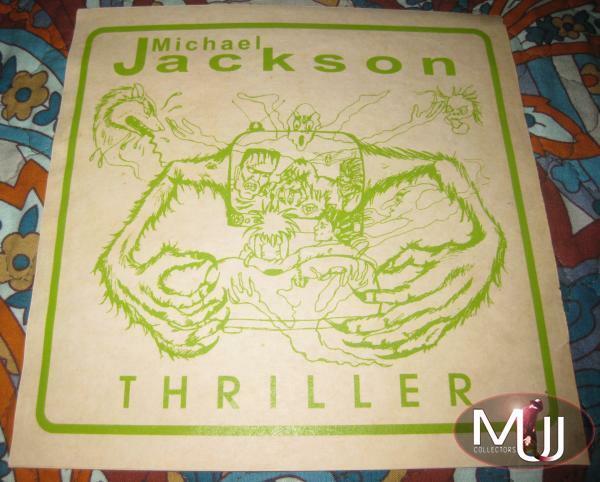 Michael Jackson “Thriller” (Emocionante) Promotional 7" Single (Peru) This very rare Peruvian promo 7" single boasts the unique green tinted picture sleeve of the “Thriller monster” original sketch Michael Jackson did for the inside of the Thriller album. On the “Pibe” label, it is unclear if this record was pressed as a special fan club release or for some Lima-Peru radio stations. The B side of the record is “Let The Music Play” by Shannon. This record (with sleeve) in excellent condition is worth $350. Michael Jackson “Thriller” Promo 7" Single (Spain) This Spanish promotional record of “Thriller” features a very unique picture sleeve showing Michael with the ghouls from the Thriller video. This record in excellent condition is worth about $350. Michael Jackson/Jackson 5 “Love's Gone Bad” Promo 7" Single (Canada) This extremely hard to find Canadian promo (#MSP-8634) was issued in limited quantities to promote the 1986 Motown “Looking Back To Yesterday” album. 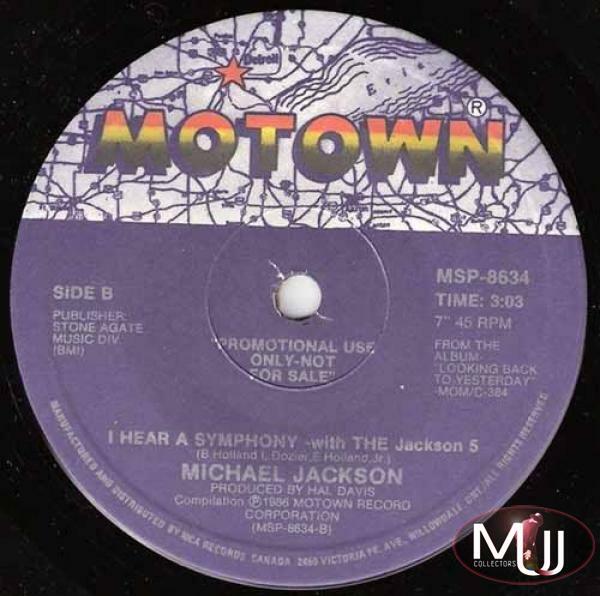 The A side is the song “Love's Gone Bad” and the B side is “I Hear A Symphony” (each with the Jackson 5), both taken from that album. This record in excellent condition is worth $350. Paul McCartney With Michael Jackson “El Hombre (The Man)” Promo 7" Single W/ PS (Mexico) Rare Mexican double sided promo 7” record from 1984 with very unique picture sleeve of Michael Jackson with Paul McCartney. On EMI label (#SEC-229). This record (with sleeve) in excellent condition is worth $300. 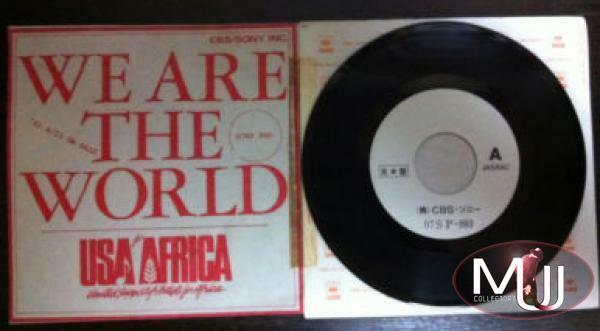 USA For Africa “We Are The World” Promo 7" Single (Japan) This Japanese promo single of the USA For Africa song “We Are The World” (co-written by Michael) was released in 1985 by the CBS - Sony Inc. label (#07S P-880). Pressed and issued in very limited quantities, it comes with a unique promo picture sleeve. In excellent condition (with sleeve), this promo record is worth about $250. 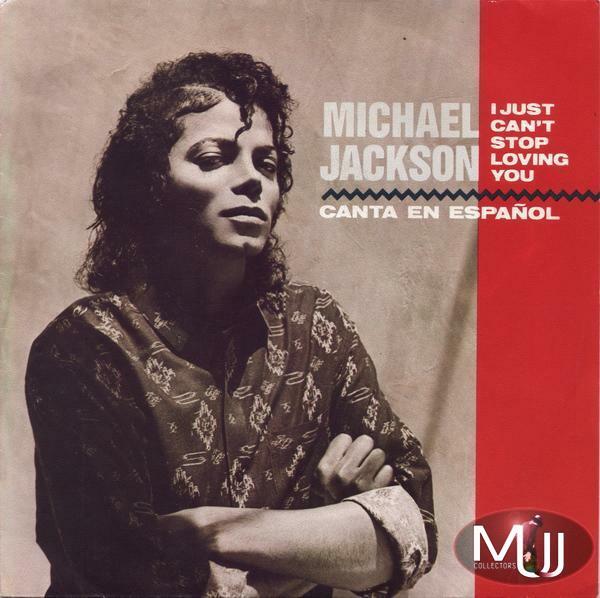 Michael Jackson “I Just Can't Stop Loving You (Canta En Espanol)” Promo One Sided 7" Single (Spain) This exclusive Spanish one sided promo release of “I Just Can't Stop Loving You” (#ARI-2059) has the main song in English, with the chorus sung in Spanish (from “Todo Mi Amor Eres Tu”). This record in excellent condition is valued at $220. 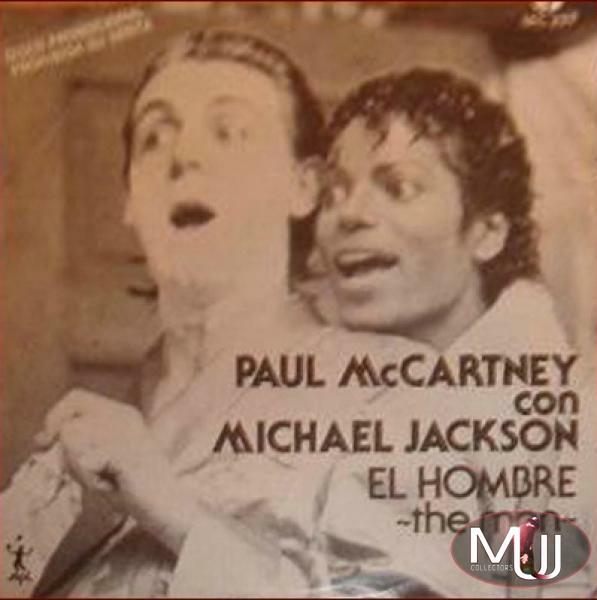 Paul McCartney With Michael Jackson “El Hombre (The Man)” Promo 7" Single (Peru) Peruvian 1983 promo 7” single on Parlophone label (#17498). This record in excellent condition is worth $200. Michael Jackson “Thriller” Promo 7" Single (France) This ultra rare French one sided promo 7” (#PRO 394) was released in 1987 just weeks in advance of the first single from the BAD album to announce its pending arrival. It includes an exclusive 38 second announcement message, and the 5:31 version of Thriller. It also features an incredible color portrait of Michael from the Say Say Say video as the picture sleeve. This record in excellent condition is worth about $180. 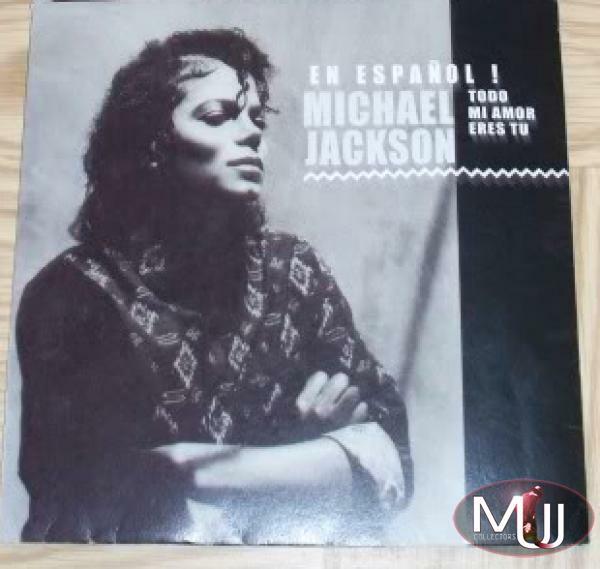 Michael Jackson “Todo Mi Amor Eres Tu” Promo 7" Single (Mexico) This rare Mexican promo single with unique “BAD LP cover” picture sleeve (#PR-650659) includes both “Todo Mi Amor Eres Tu” (A side) and “I Just Can't Stop Loving You” (Original Version) on the B side. Picture sleeve reads: "Gratis Este Disco Sencillo En La Compra Del LP - No Puede Ser Vendido Por Separado". In excellent condition (sleeve and vinyl), this record is worth at least $150. 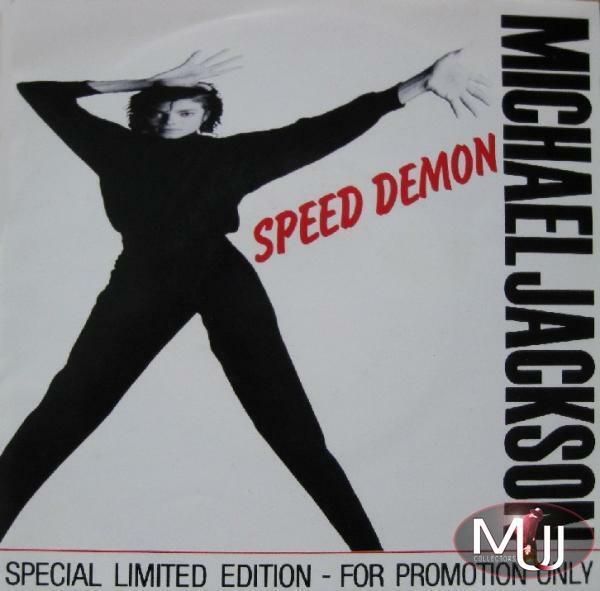 Michael Jackson Speed Demon 7” Promo Single (Holland) This Dutch promotional single is the only vinyl single release for the song “Speed Demon”. This record was issued in 1989 from its exposure in the “Moonwalker” film, but was never commercially issued. With a unique picture sleeve featuring artwork from inside the BAD LP gatefold, it’s worth around $150. Paul McCartney With Michael Jackson “The Man” Promo 7" Single (Philippines) This promo 7” single of “The Man” from the Philippines is on the Parlophone label (#PAL-61176) and was issued in 1984. This record in excellent condition is worth about $150. Michael Jackson “Todo Mi Amor Eres Tu” Promo 7" Single (Colombia) This rare Colombian promo record (PROMOC-154-87) features Todo Mi Amor Eres Tu on both sides of the vinyl and contains a picture sleeve which reads: “'Lleve Este Disco GRATIS Por La Compra del LP o Cassette BAD” indicating the single was free with the purchase of the BAD album on vinyl or cassette. This record in excellent condition is worth about $150. 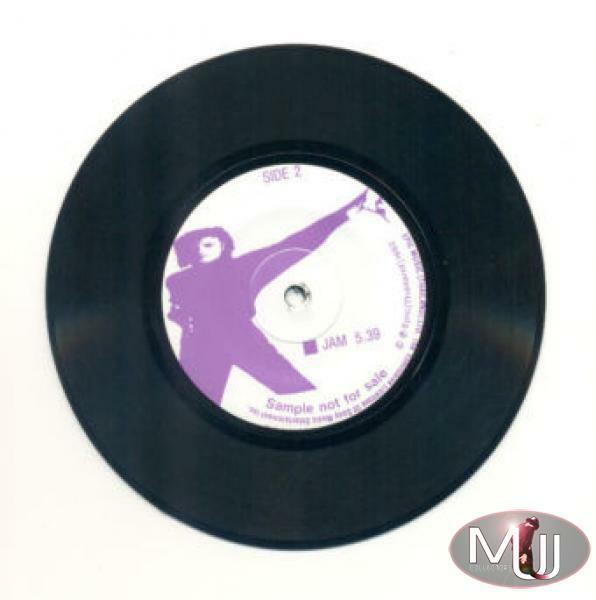 Michael Jackson "Billie Jean"/"Jam" Promo 7" Single (Thailand) This 1993 Thai promo was issued in conjunction with Michael Jackson’s 1993 Dangerous concerts. No picture sleeve, but the record label contains custom artwork from the Dangerous and BAD albums. In excellent condition, this record is worth about $100. In addition to the above, there are at least two supposed promo 7” that we have yet to see: a rare cancelled USA 7” from the 1979 “Boogie” LP (with picture sleeve) and a 1992 USA deleted promo 7” (#69-12) of “Someone Put Your Hand Out”, which was apparently to be released as a Dangerous Tour promo through Pepsi. If anyone has ever seen these or other rare or obscure records, please email us! 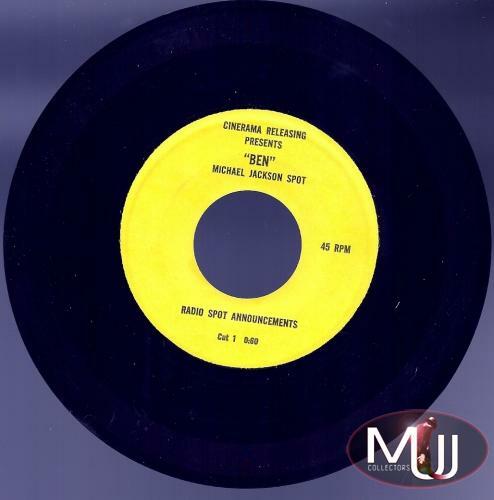 Cinerama Releasing Presents "Ben" Michael Jackson Spot Special Radio Broadcast 7" Single (USA) This one sided radio broadcast record was released in July of 1972 to promote the movie “Ben”, and features an excerpt from the song. Yellow label promo on the Cinerama/Radio Spot Announcements label. No record number is listed. This record in excellent condition is worth about $600. 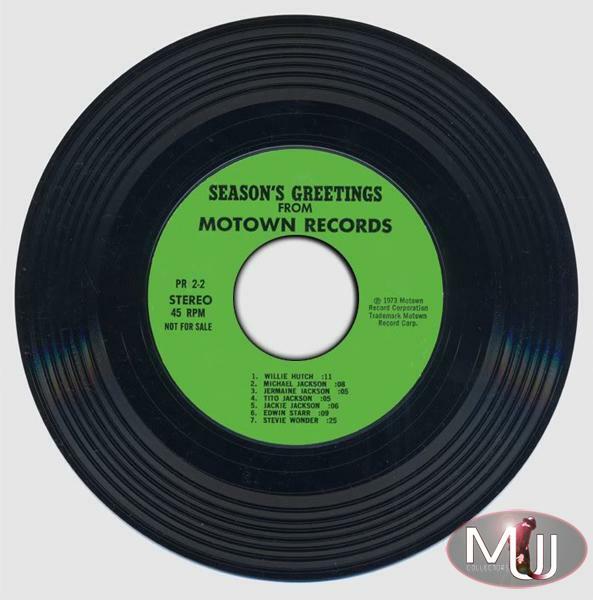 “Season's Greetings From Motown Records” Promo 7" Single (USA) This double sided radio broadcast record (#PR 2-1/PR 2-2) was issued by Motown in 1973. It contains Christmas greetings from several Motown artists including separate greetings from Michael, Jermaine, Tito, and Jackie. This record in excellent condition is worth $300. 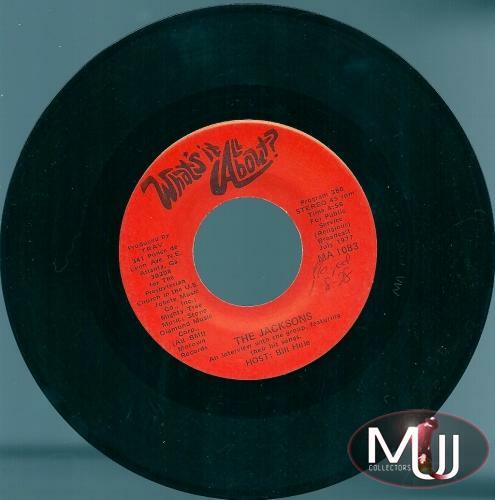 The Jacksons: “What's It All About?” Special Radio Broadcast 7" Single (USA) This rare broadcast record originally aired in July, 1977 and features The Jacksons (Program 380): "An Interview With The Group, Featuring Their Hit Songs" (#MA-1083) with Jackie, Tito, Marlon, and Michael interviewed by host Bill Huie. Song excerpts include: Enjoy Yourself, I Want You Back, Never Can Say Goodbye, and Dancing Machine. Released on the “Trav” label, the B side features Marilyn McCoo and Billy Davis. Used for Public Service (Religious) Broadcast for the Presbyterian Church. This record in excellent condition is worth about $250. 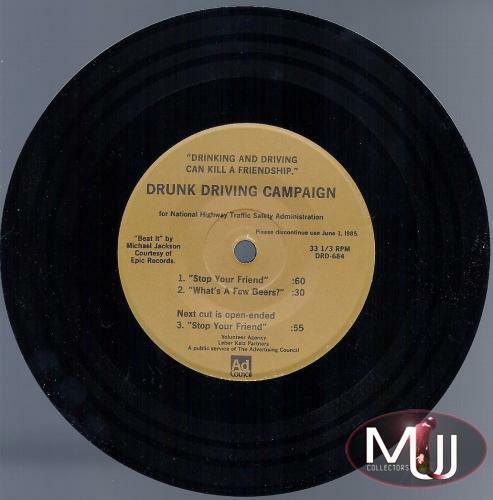 Drinking And Driving Can Kill A Friendship Special Radio Broadcast 7" Single (USA) Scarce radio broadcast record (#DRD-684) from 1984, featuring Michael Jackson’s “Beat It”, courtesy of Epic Records. Same content on both sides, this record plays at 33 1/3 RPM. Issued by the Drunk Driving Campaign For National Highway Traffic Safety Administration. This record in excellent condition is worth about $150. 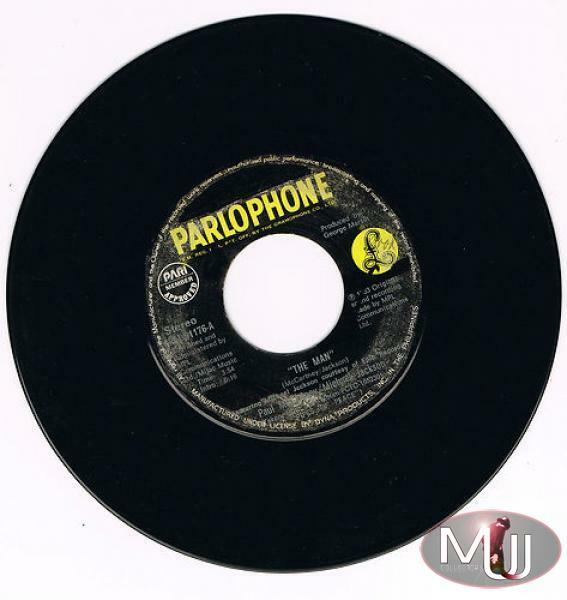 Visit the Promotional 7" Singles section of our Memorabilia Showcase for a complete list of all Michael Jackson promotional 7" Singles. 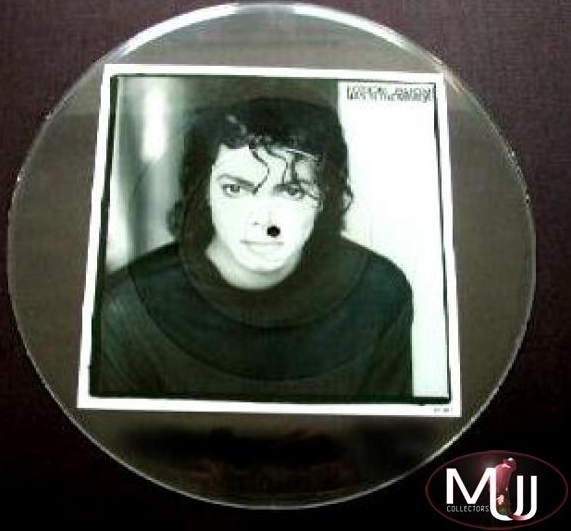 Michael Jackson “Man In The Mirror” Uncut 8" Picture Disc *Test Pressing* (UK) Commercially issued as an 8” square picture disc, this uncut test pressing of the Man In The Mirror picture disk (#651388-9) was produced in very limited numbers, and not intended for commercial availability. In excellent condition, this record is worth about $500. Michael Jackson “BAD Souvenir Singles Pack” UNCUT Picture Disk Test Pressings (UK) These rare uncut versions of the below 5 picture disk pack were used as test pressings by Sony UK to check image alignment and print quality before the final run of the square disks were cut for inclusion in the commercial picture disk pack. Each 12” test pressing contains the uncut square disk inside, surrounded by clear vinyl. Very few of each record was produced in these uncut formats, and they were never met for commercial distribution, so remain very rare. Each of them in excellent condition are worth about $200 each: BAD (shown above left), Dirty Diana, Man In The Mirror, I Just Can't Stop Loving You, and The Way You Make Me Feel. 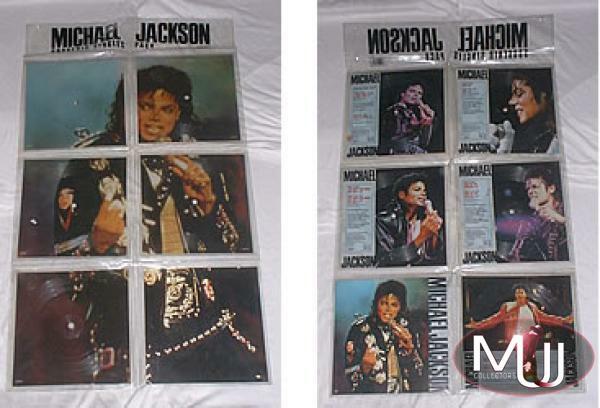 Michael Jackson “BAD Souvenir Singles Pack” Limited Edition 5 Picture Disk 7" Singles Set (UK) This stellar limited edition set (#MJ5) was issued by CBS Epic/MJJ Productions in the summer of 1988 during Michael's European BAD Tour. It contains five double sided 7" square vinyl picture discs in a special PVC display wallet, along with a lyric/picture booklet featuring scenes from the BAD Tour. Each picture disc features a different “live” image of Michael, whereas the flip sides form a large 14”x21” live shot from the BAD Tour. Each disc has tracks on the front and back side, with the primary songs being I Just Can't Stop Loving You (#650202), BAD (#651155), The Way You Make Me Feel (#651275), Man In The Mirror (#651388) and Dirty Diana (#651546). In excellent condition, this set is currently worth about $120. Visit our 7" Picture Disks section of our Memorabilia Showcase for a complete listing of Michael Jackson and Jacksons 7" picture disc records. 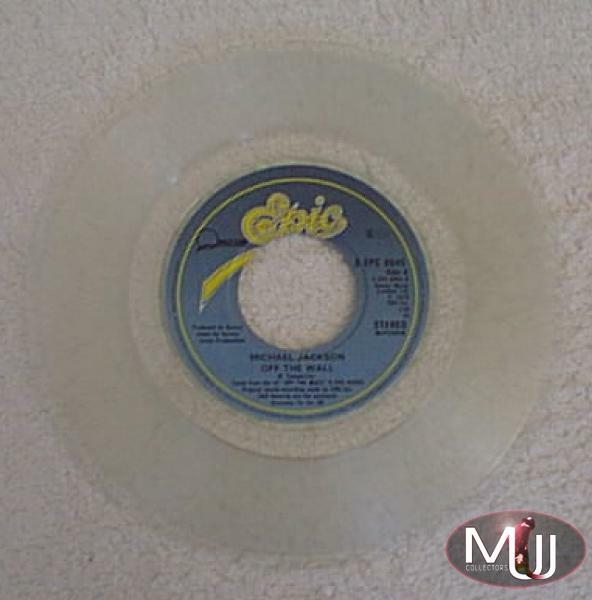 Michael Jackson “Todo Mi Amor Eres Tu” Promo Blue Vinyl 7" Single (Colombia) This mega rare Colombian promotional vinyl of Todo Mi Amor Eres Tu (#154-87) comes in a custom picture sleeve, and is pressed on blue vinyl. Same song on both sides, with lyrics on the back of the sleeve. This record was only originally available if you purchased a limited copy of the BAD LP in 1987. In excellent condition, this record is worth about $450. 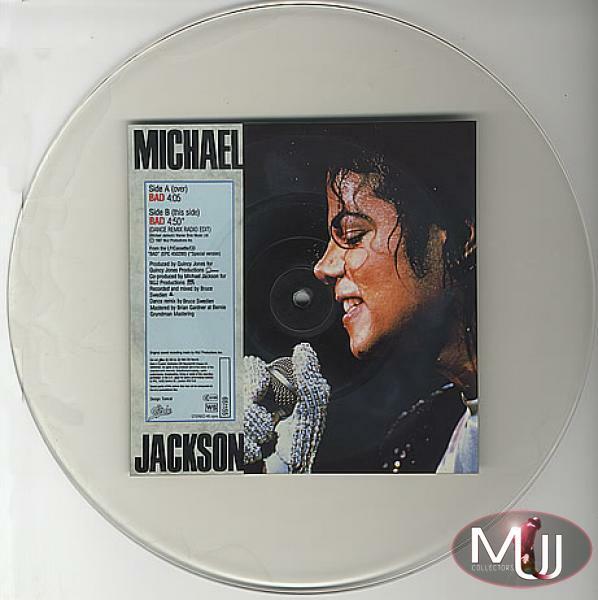 Michael Jackson “Off The Wall” Limited Edition Clear 7" Vinyl Record (UK) This exclusive release of “Off The Wall” (#EPC-8045) from the UK was released on clear vinyl. Backed with “Working Day And Night”. In excellent condition, this record is worth about $400. 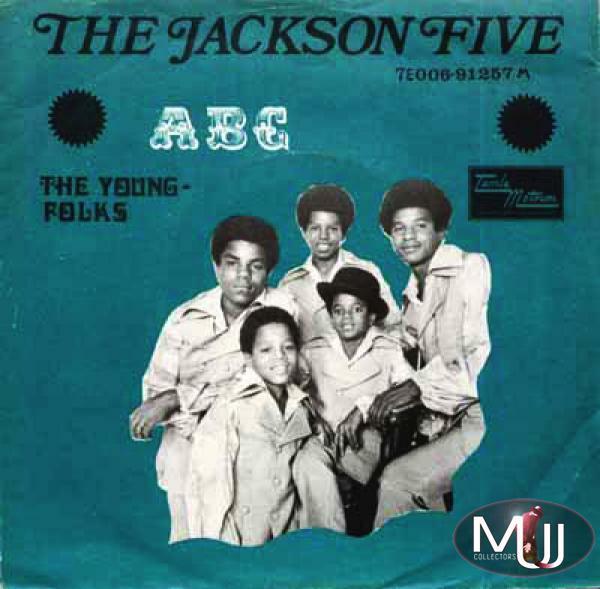 The Jackson Five “ABC” Promo 7" Single *Gold/Yellow Vinyl* (USA) In the USA, Motown released five different white label promo records on colored vinyl starting with I Want You Back Red Vinyl which was issued on red vinyl. 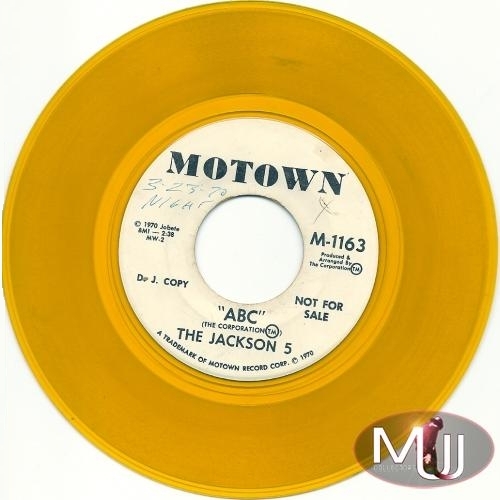 The second such release, ABC, was pressed on gold vinyl (#M-1163), and was sent to radio stations with a special title sleeve which described the release as the fastest Motown single to ever pass 1 million sold…in 12 days! This record is worth around $200 if with that original sleeve. 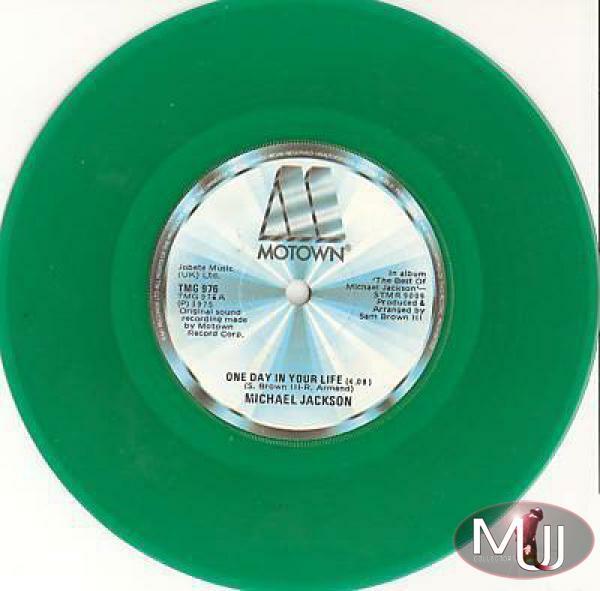 Michael Jackson "One Day In Your Life" Limited Green 7" Single Vinyl (Ireland) This Irish green vinyl release (#TMG 976) from 1975 is worth about $100. 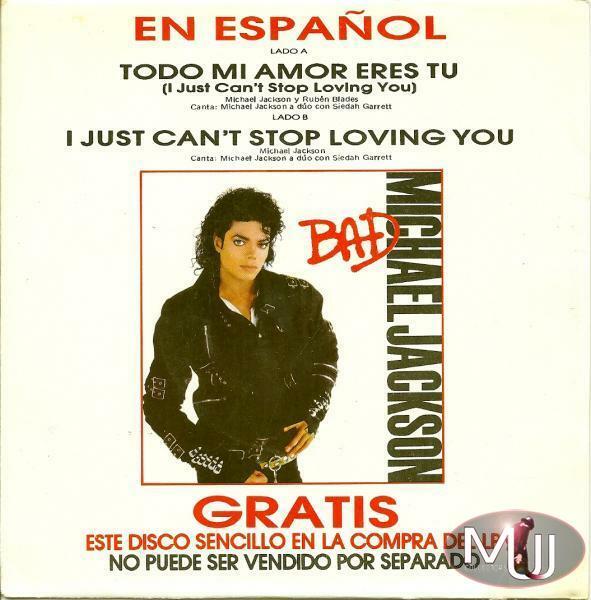 Michael Jackson “Todo Mi Amor Eres Tu” Limited 7" Single (Costa Rica) This uber-rare Costa Rican 7” single (#PR-04/88) includes the Spanish and English versions of I Just Can’t Stop Loving You. 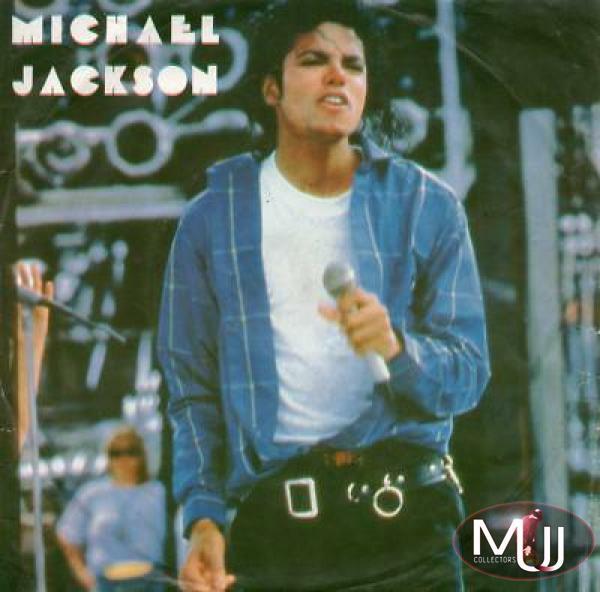 But easily the most unique feature of the record is the picture sleeve, taken of Michael Jackson rehearsing for the BAD Tour in 1987 (generally sleeve covers are professional “photoshoot” pics). This single was pressed in very limited numbers, and today in excellent condition (record and sleeve), this record is worth about $1500. Michael Jackson BAD Tour '88 Creditanstalt Bank Promo Press Kit (Austria) This rare promo kit was given by Austrian Creditanstalt Bank to customers who opened a bank account during 1988 to promote the BAD Tour. The kit came inside a nice vinyl/plastic bag and included a 7” record inside an exclusive double sided sleeve. The exact record (a UK release) would vary from one of the BAD LP singles including I Just Can’t Stop Loving You, BAD, Dirty Diana, etc. 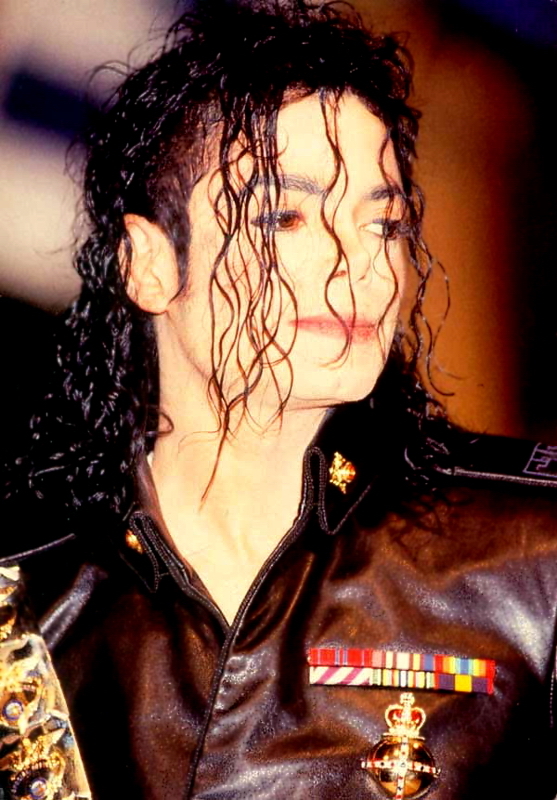 The kit also included a postcard and some biography sheets, given to the press for the launch of the BAD Tour in Austria in 1988. Very few still exist since Pepsi halted the production over use of their logo without permission. This kit (with complete contents) in excellent condition is worth about $600. 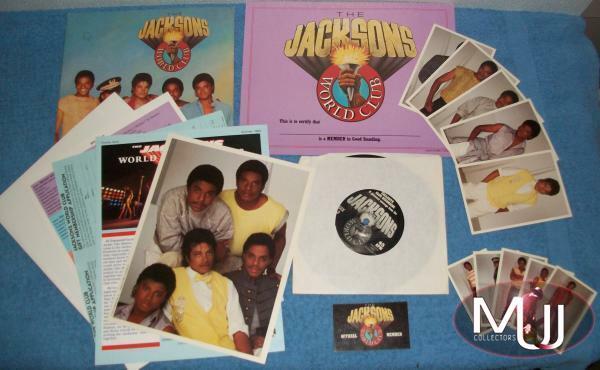 The Jacksons World Fan Club Kit With “Exclusive Club Recording” 7” Record (USA) This official deluxe fan club kit from “Jacksons World Club” was issued in 1983 and came inside a special folder. 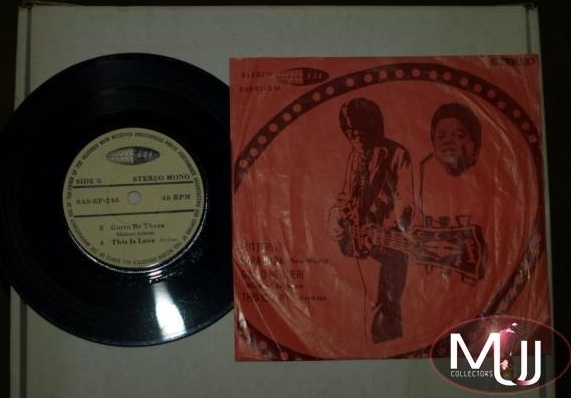 Among the contents was an exclusive double sided 7” record "Exclusive Club Recording: A Personal Message From The Jacksons", featuring "Surprise Song" issued through “Five Brothers Music/EMMC”. The kit also included the "Charter Issue" of the Jacksons World Club Newsletter, membership card and certificate, two separate sets of photo cards, a "Bio Sheet" on The Jacksons, a large group photo, and a 17”x22” poster. The complete kit (including the record) is worth at least $400. Michael Jackson “Another Part Of Me” Limited Edition 7" Single With Laminated Souvenir Backstage Pass (UK) The UK actually released two limited editions of “Another Part Of Me”, a posterbag version (#652844-7) and this much rarer version with a laminated “Free Souvenir Backstage Pass” (#652844-9) to coincide with the “BAD UK Tour 1988”. In excellent condition, this record is worth about $150. 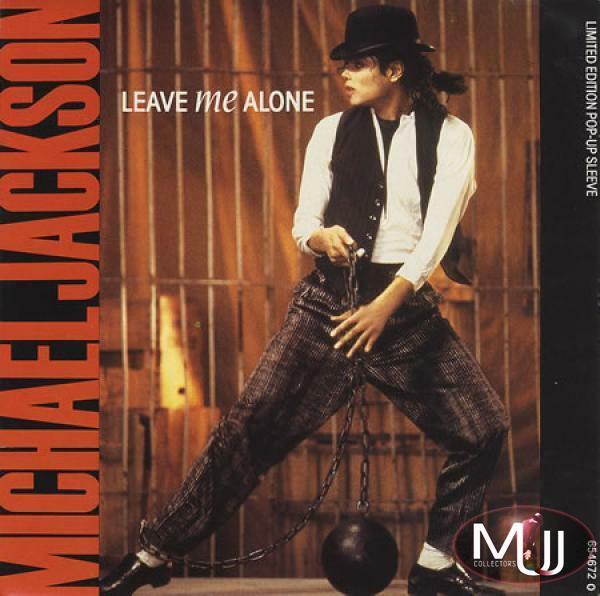 Michael Jackson “Leave Me Alone” Limited Edition Pop-up 7" Single (UK) This limited edition UK novelty (#654672-0) is housed in a special gatefold cover with an exclusive “pop up” cut out of Michael Jackson from the “Leave Me Alone” short film inside. In excellent condition, this is worth about $150. Michael Jackson “Dirty Diana” Limited Edition 7" Single W/ Michael Stand-Up (UK) This UK novelty record (#651546 7) issued in 1988 includes a small “Dirty Diana” stand-up of Michael. In still sealed condition, this limited edition is worth at least $100. Visit the Records section of our Memorabilia Showcase for complete listings of all Michael Jackson 7” Limited Edition Singles including colored vinyl and UK novelty records. Also be sure to read our extensive articles on the Rarest Michael Jackson Albums and Rarest 12" Singles!